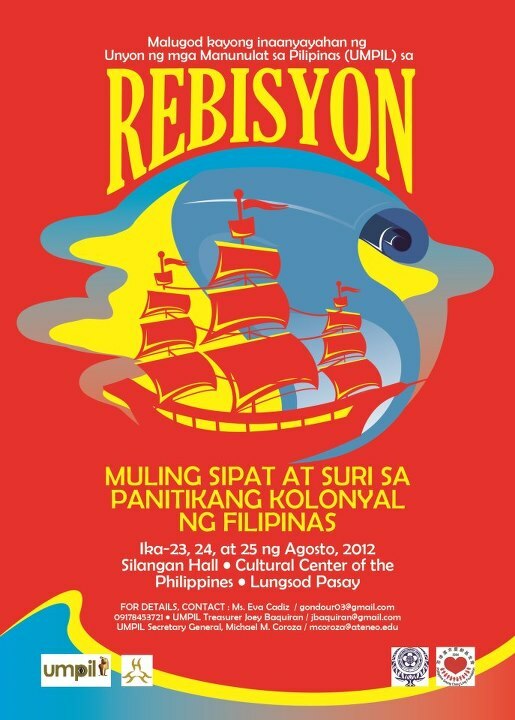 As a significant part of its annual convention, the Unyon ng mga Manunulat sa Pilipinas (UMPIL) will hold the Colonial Literature Revaluation Conference for Teachers entitled "Rebisyon: Muling Sipat at Suri sa Panitikang Kolonyal ng Filipinas" on 23-25 August 2012 at the Silangan Hall, of the Cultural Center of the Philippines in Pasay City. Guest of honor is National Artist for Literature Virgilio S. Almario. On 23-24 August (Thurs-Fri), respected scholars will deliver papers on the colonial (Spanish period) literature like the pasyon, awit/korido (metrical romances), komedya, and the proto-novels (Urbana at Felisa, Tandang Bacio Macunat etc.). Each one is assigned a particular literary genre and is expected to give new insights on the subject. To further inspire the teachers explore methods of teaching these texts, veteran educators will demo-teach on the poetic and prose forms, namely Prof. Danilo Francisco M. Reyes (AdMU) and Prof. Ferdie Lopez (University of Santo Tomas). The event is made possible by the support of Cultural Center of the Philippines, the Commission on Higher Education (CHED) and the Department of Education (DepEd). UMPIL members, teachers, and other interested parties are encouraged to attend the conference as well as the convention. For details, text Ms Eva Cadiz at +63.917.8453721 or email the conference director and UMPIL Secretary General Michael M. Coroza at mcoroza@ateneo.edu.